IT must deliver Availability 24.7.365 for a demanding enterprise ecosystem. Business requirements today are simple. Yet, simple is not always easy, especially when an organization is not highly-virtualized. 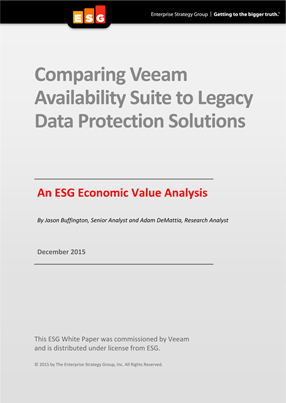 Through extensive research conducted by ESG, the analysis presented in this report will help organizations determine relative costs and benefits when comparing Veeam® Availability Suite to legacy alternatives. Total cost of ownership (TCO) is reduced by more than $650,000, while adding business value, chiefly in the form of increased asset availability, in the $2 million range. Download this report today to view the full economic analysis, and then contact a Veeam Availability Advisor to receive your own complimentary ROI analysis.